HomeAim High Profits News Gemini Group Global (GMNI) Stock To Get Lit Up? 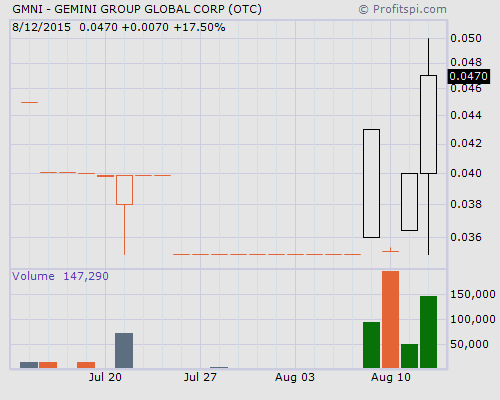 Gemini Group Global (GMNI) Stock To Get Lit Up? Landing in inboxes shortly after yesterday’s close, the promotional campaign has officially begun for Gemini Group Global Corp. (OTC PINK: GMNI), a development stage company dedicated to capitalizing on the growing vapor and e-cigarette market. Shares of GMNI stock started to see some trading activity as of last Friday with roughly 500,000 shares now having changed hands between 0.50 and 0.05. Although the love for paid promotions has become more of a hate, in terms of penny stocks to buy when the market opens, the track record shows that no one but the hiring third party owns shares less than 0.03. News should be available before the end of the week to help promote GMNI shares since the last announcement, June 23, stated how the Company executed a Product Distribution Agreement with Royal Vapour, LLC, a California-based manufacturer, marketer, and distributor of premium e-liquids for electronic cigarettes and vaping. While there’s dozens upon dozens of competitors in the sector, to see something pop up about another distribution deal or even sales for the month ended July 31, something other than “GMNI – A Hidden Gem!” is going to be necessary if buyers are going to do anything more than flip it. A very interesting point to consider comes from the Mar 31, 2015 Quarterly Report which states that of the 329,500,010 shares issued and outstanding, 307,000,000 are restricted (which in reality means pretty much nothing). Other penny stocks like UVND and EKCS are much better bets for those playing low floats, but today’s action at the open, for sure a gap above 0.05, should provide for ample opportunity to recover some of the $10,000 being paid to promote it. Last updated by Timothy Richards at August 13, 2015 .